It's been almost a year since I last had any work down in the Crossroads in KC, but this Friday I am making a return for the 12th Annual Contemporary Figurative Exhibition taking place at Hilliard Gallery. I actually discovered this show last year, but it was too late for me to enter it. So I vowed I would be in it this year. 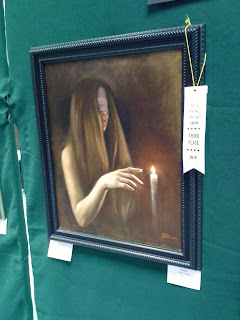 Sure enough, I have two pieces in the show, which runs from First Friday, April 5th until May 31st. The two pieces I have in the show are The Sleeper and See. 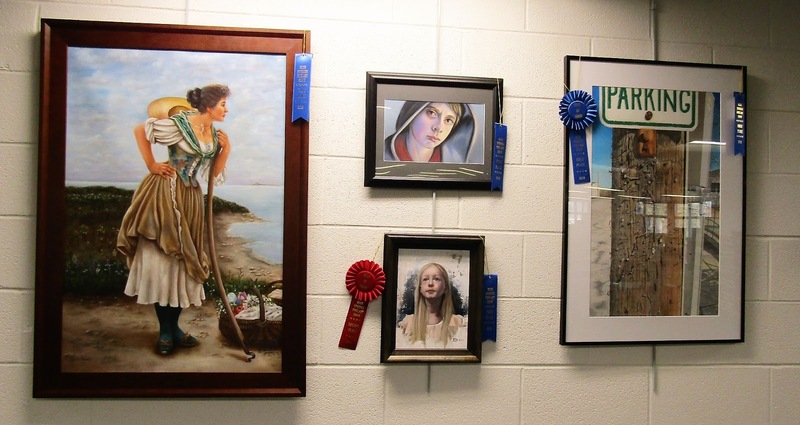 The Blue Springs Fine Art Show was yet another good success for my work. 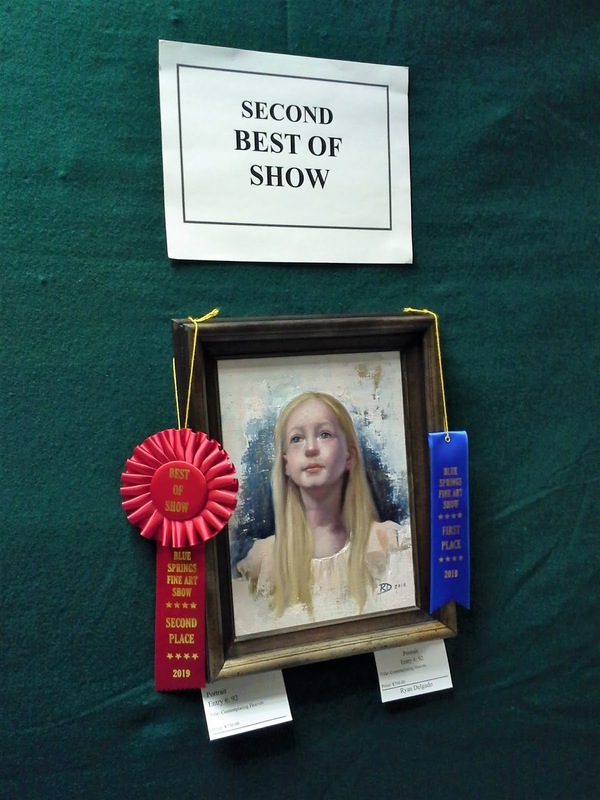 What is Unseen received the 3rd place portrait award, while Contemplating Heaven received the 2nd Best of Show award and was displayed at the local Blue Springs north branch of the Mid Continent Library through the end of March. I recently finished a commissioned portrait, and now I have new work in progress, and will be working all through spring and summer to get more new pieces finished in time for the next NOAPS deadline for the Best of America exhibition in the fall. I am hoping for good things this time. I am taking my acceptance into the small works show as a good thing, but there are no guarantees, of course. In addition, I am planning on much more plein air practice as the weather gets warmer. 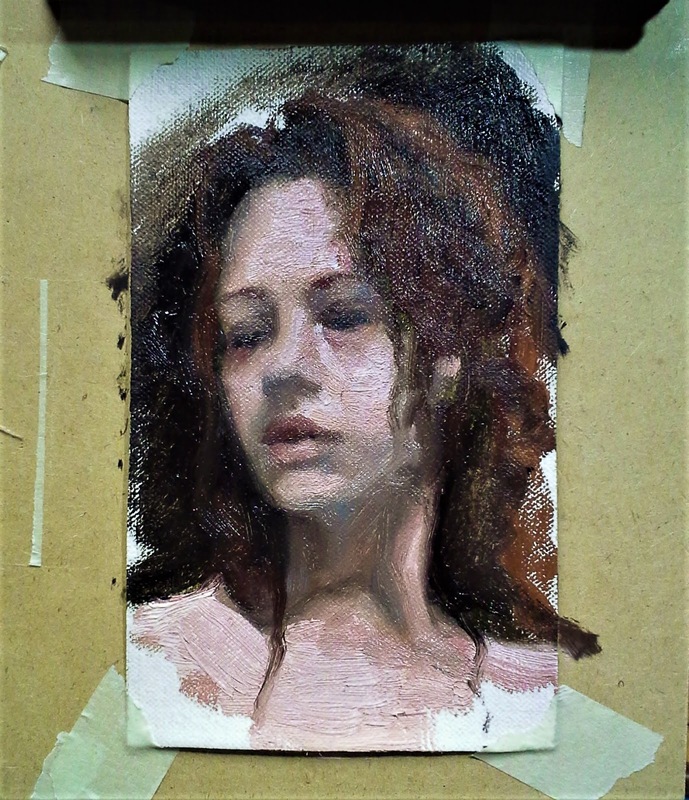 This has been a long time coming, and I'm looking forward to a brand new challenge that will get me beyond the walls of my studio, and hopefully give me new and exciting opportunities as a painter. While I have done plein air painting plenty of times before, it has never been a strength or a consistent practice for me. Hopefully that will change. 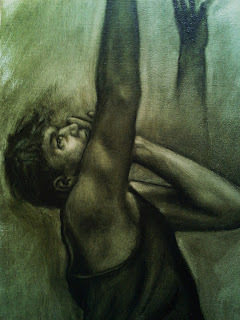 Here is a peek at my latest work in progress, to be titled For Your Hand to Take Me Away. I am also looking forward to recording some new videos for YouTube soon, including a look at this new painting and others to come. Stay tuned for more! A few weeks ago, I finished up a new landscape piece (see previous blog post for the finished painting). It took me a while, but I finished editing the video for that painting, and it is now posted to YouTube. This vlog is basically a short compilation of clips chronicling the painting from start to finish. Hope you enjoy, and as always stay tuned for more. I will also be showing at the Blue Springs Fine Art Show this weekend, March 2-3, at Vesper Hall in Blue Springs, MO. This is my 10th time doing the Blue Springs show. Unfortunately, the weather here in the KC area is once again looking pretty bad for Sunday the 3rd. So it's likely your best chance to catch the show is tomorrow, March 2nd. The show will be open from 10am-5pm. And for you brave souls venturing out on Sunday, the show will be open from 11am-4pm. 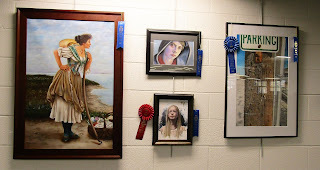 I have two works showing - Contemplating Heaven and What is Unseen. Both are available for sale. Hope you can check them out this weekend! The first two works of 2019 are finished, and so is their vlog series. Here is the final installment on the first works of the year. Often, I would say that one of my favorite parts of the painting process is putting the final touches down. Such was the case with these. They were both challenging, and I'm happy to say they are finished and I'm ready to move on to the next projects (one of which is already in progress). The paintings are in the final stretch. Okay, full disclosure... the paintings are actually finished. But I haven't finished editing the video footage for the last installment yet. So you'll have to wait a little more to see the final products. But here is the latest vlog of the progression. Hope you enjoy! The first two paintings of 2019 are coming along. Here is the latest vlog showing their progress. 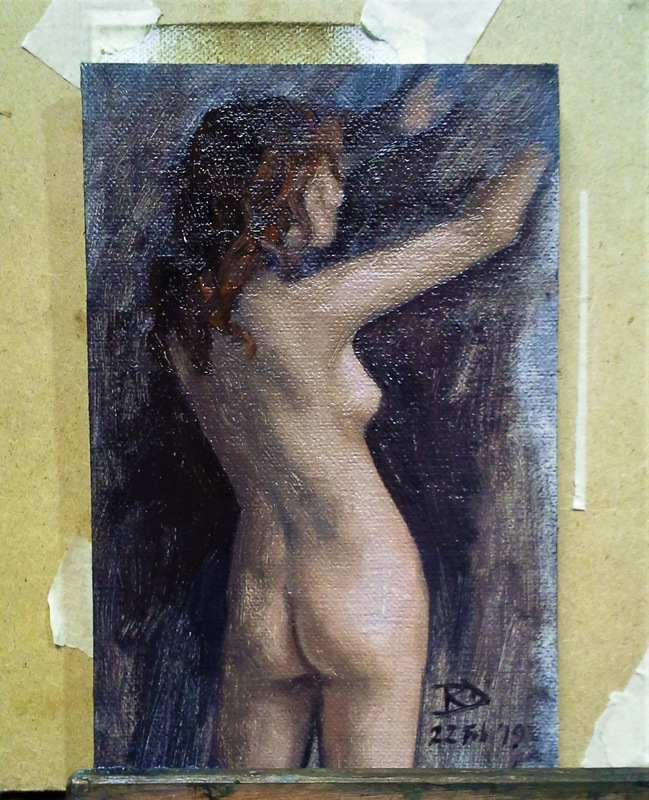 In the first segment I work on the grisaille for the larger portrait piece, and then in the second part I work up the first layer of color on the smaller figurative piece. At this point, I've already finished the first color stage on the portrait, and I'm planning on making the next vlog documenting that and the second color layer as well. Hopefully the figurative piece will be finished with its next painting session. So stay tuned for more. Again, thanks for watching and subscribing to my channel! I can still see a few adjustments that need to be made and issues to resolve, but I will be able to make those adjustments as I move into the first color stage. At that point, I'll be able to do more refinement with edges, and additional work with values. As this grisaille dries, the values will go slightly darker, so I will have to brighten the lights as I work with color. Until then, I hope you all are enjoying this process. And with the weather we've been having lately, it's been a perfect opportunity to spend time in the studio and to record it all for you. Stay tuned as we move into the first color stage next!